Background: Atherosclerosis (AS) is a chronic arterial disease and a major cause of vascular death, with multiple pathogenesis including chronic inflammatory. Tripterygium wilfordii (TGW) had a good effect on an anti-inflammatory. At present, more and more researches indicated that TGW could also regulate AS. Objective: The aim of this study is to clarify what the anti-atherosclerotic ingredients are in TGW and whether these ingredients improve AS synergistically. Materials and Methods: First, systematic pharmacology was utilized to predict the active ingredients and potential targets of TGW related to AS. Then, a bioactive compound of triptolide (TPL) and Tripterine (TPR) in TGW were evaluated if they presented the synergistically anti-atherosclerotic effects in Apo E-/-mice fed with a high-fat/high-cholesterol diet. In the experiment, Hematoxylin and Eosin tested the plaque areas; reverse transcriptase- polymerase chain reaction and Western blot analysis detected the matrix metalloprotein 9 (MMP-9), tumor necrosis factor alpha (TNF-α), and NF-κB levels in the aortas. Results: The results shown that there are 17 bioactive compounds with 76 therapeutic proteins were identified. Moreover, TGW exhibits a protective effect on treatment AS likely through regulating multiple pathways including immune response, inflammatory response, and vascular structure improving. Further verified that TPL combined with TPR in TGW had synergistic effect on treatment AS by reducing levels of MMP-9, TNF-α, and NF-κB, might be the important pathway. Conclusion: TGW, synergistic effect of different compounds, could regulate AS by multiple pathways, especially improving immune response, inflammatory response, and vascular structure. The major compounds of Tripterine and Triptolide in TGW had a synergistic effect on anti-AS by suppressing matrix metalloprotein 9, TNF-α, and NF-κB. Abbreviations used: TGW: Tripterygium wilfordii, TRL: Triptolide, TRR: Tripterine, TRLR: TRL plus TRR, NC: Normal control, MC: Model control, MMP-9: Matrix metalloprotein 9; NF-kB, Nuclear factor-kappa B; TNF-a, Tumor necrosis factor alpha, AS: Atherosclerosis, H and E: Hematoxylin and Eosin, ox-LDL: Oxidized low-density lipoprotein, ICAM-1: intercellular adhesion molecule-1, VCAM-1: vascular cell adhesion molecule 1, HIF-1: Hypoxia inducible factor-1, IL-2: Interleukin-2, IFN-γ: Interferon-γ, MCP-1: Monocyte chemotactic protein 1, TCMSP: Traditional chinese medicine systems pharmacology, TCM: Traditional chinese medicine, PerOB: Predict oral bioavailability, PerDL: Predict drug-likeness, HL: Half-life, HFC: High-fat/high-cholesterol diet, T-P: Target-Pathway, KEGG: Kyoto Encyclopedia of Genes and Genomes, DAVID: Database for Annotation, Visualization and Integrated Discovery, ADME: Absorption, distribution, metabolism, excretion, TBST: tris-buffered saline, GAPDH: Glyceraldehyde-3-phosphate dehydrogenase, DMSO: Dimethyl sulfoxide, HPLC: High Performance Liquid Chromatography. The major compounds of Tripterine and Triptolide in Tripterygium wilfordii had synergistic effect on anti-atherosclerosis. Atherosclerosis (AS), chronic arterial disease and a major cause of vascular death, is a chronic inflammatory disease promoted by hyperlipidemia. Fatty streaks in arterial walls gradually develop into atheroma and characteristic plaques. The acute rupture of these atheromatous plaques causes local thrombosis, leading to partial or total occlusion of the affected artery. Its major clinical manifestations include as follows: coronary heart disease, cerebral infarction, and peripheral vascular disease, which is the leading cause of death and major health-care burden in worldwide regardless of different ethnicities. Lipid metabolism disorder and lipid accumulation are the foundation of atherosclerotic lesions. It is thought that AS is not only a simple lipid sedimentary in a blood vessel but also a process of chronic low-grade inflammation., Inflammation is accompanied by the occurrence and development process of AS, a lot of inflammatory factors aggravate AS by triggering inflammation. At early stage AS, ox-LDL elicits vascular endothelial releasing monocyte chemotactic protein 1, which could promote the mononuclear cell into macro phagocyte entering into endangium. At this phase, NF-κB is activated and participated in the expression of inflammatory mediators. Pro-inflammation cytokines, such as Interleukin-1 (IL-1) β, IL-6, and tumor necrosis factor alpha (TNF-α), are stimulated and released, which would speed up the development of AS. Inner surface of blood vessels would form plaque with AS, while matrix metalloprotein (MMPs), such as MMP-9, could degrade the fibrous cap and reduce the stability of plaque, further to induce thrombus. The pathomechanism is very complex and hence, the treatment of AS should consider as regulating multiple pathways. Tripterygium wilfordii (TGW) is a famous traditional Chinese medicine (TCM). A growing number of evidence had proved that TGW had beneficial effects on various cancers, immune function,, rheumatoid arthritis,, and hyperlipemia. In our previous researches, we found that extract of TGW could improve AS in mice model. For this sake, we would want to know what compounds in TGW and how these compounds could play the role of anti-AS. Recent years, systems pharmacology, has made a notable contribution to explore and predict the molecular mechanisms of TCM through pharmacokinetics evaluation (such as ADME), compounds-targets network or target-pathway network. Here, we make use of this method to find the active compounds in TGW, correlated targets and pathways, which were strongly related to AS. To further developing the TGW on anti-AS, we chosen active ingredients of triptolide (TPL) and Tripterine (TPR) in TGW and performed pharmacodynamics research in Apo E-/-mice AS model for further study. All chemical compounds in TGW were found out from database of traditional Chinese medicine systems pharmacology (TCMSP) (http://lsp.nwu.edu.cn/index.php). Three in silico ADME models including predict oral bioavailability (PerOB), predict drug-likeness (PerDL) and Half-life (HL) were used as filter parameter to obtain the active ingredients of TGW. The threshold values for the three screening models are set to PerOB ≥30%, PerDL ≥0.18, and HL ≥4, respectively. The screened out active compound are considered as candidate ingredients. We used the selected compounds as baits to find out mostly likely protein targets from the TCMSP database. Genes associated with AS were collected from the database of Genecards (http://www.genecards.org/). Candidate protein targets related to AS for TGM were picked conforming to both baited from TCMSP database and Genecards. Input these candidate molecules targeted proteins into the Uniprot (http://www.uniprot.org/) for further mapped to find the corresponding gene name. For the sake of clarifying the interrelation of bioactive ingredients, targets and AS, Cytoscape 3.2.1 software (University of California and Institute for Systems Biology, etc., USA; http://www.cytoscape.org/download.php) was used to establish a visualized network of the compound-target network (C-T network). Searching KEGG database and found the pathway related to targets. Then establish a visualized network of Target-Pathway network (T-P network). We utilized intersectional targeted genes of AS and active compound related as bits to fish the corresponding function from DAVID database (https://david.ncifcrf.gov/), a comprehensive set of functional annotation tools for understanding the biological meaning behind large lists of genes, to get the gene ontology analysis. Enriched geno ontology (GO) terms was defined as significantly with adjust P < 0.05. The picture of GO terms was generated with ggplot2 and R software into visualization. TPL and TPR were important compounds in TGW. From the C-T-D network we had found that both TPL and TPR were related to the AS, we evaluated the synergistic effects of TPL and TPR on Apo E-/-mice fed with a high-fat/high-cholesterol diet. Twenty-four male 8-week-old Apo E-/-mice (18–20 g) were purchased from Beijing Vital River Laboratory Animal Technology Co., Ltd. (Beijing, China), all the animals were hosted at room temperature of 25°C and at 45%–55% relative humidity with a 12-h light-dark cycle. The mice were fed with high-fat/high-cholesterol diet (HFC, Trophic Animal Feed High-the Co., Ltd., China; 10% fat, 1.25% cholesterol and 0.5% bile salt.) and standard water, which were randomly divided into four groups (n = 6 per group), following as HFC model control group (MC), HFC plus TPL group (TRL), HFC plus TPR group (TRR), and HFC plus TPL and TPR group (TRLR). At first, the mice were fed with HFC-diet for 4 weeks. Then, the drugs or vehicle were daily administrated to mice fed with HFC-diet sustaining for 8 weeks, respectively. The drugs or vehicle administration scheme as follows: the mice in MC group were fed with HFC and received dimethyl sulfoxide (DMSO; batch number SHBC2572V; SIGMA, USA) by intraperitoneal injection. The mice in TRL, TRR, and TRLR groups were all fed with HFC and respectively received 0.2 mg/kg of TRL (99.9% detecting by HPLC analysis; batch number B20709; YuanYe Chemical Co., Ltd; Shanghai, China), 0.6 mg/kg of TRR (99.9% detecting by HPLC analysis; batch number B20707; YuanYe Chemical Co., Ltd; Shanghai, China), or 0.2 mg/kg of TRL plus 0.6 mg/kg of TRR by intraperitoneal injection. The TRL, TRR, and TRLR were all dissolved with DMSO, and the final concentration of DMSO was 1%. Six male 8-week-old C57BL/6J mice were fed the normal diet only as a normal group (NC). After the blood was taken, the aortas nearly the heart were put into 10% formalin solution and embedded in paraffin. The wax chunks with aortas were cut into four-micron-thick sections staining with Hematoxylin and Eosin. The plaque areas and endometrial thickness were using image analysis program (Image-Pro Plus 5.0). After the blood was taken, partial aortas were cut into serial pieces and extracted total RNA. Then, total RNA was reversed transcription to cDNA samples. Then, the experiments of real-time fluorescence quantification polymerase chain reaction (PCR) were performed according to 2 × SG Fast qPCR Master Mix (Sangon Biotech; Shanghai, China) and the reaction system was total to 20 μL. The reaction condition was simply described as: 94°C predegeneration for 10 min, 94°C predegeneration for 30s; 55°C annealing 30s, 72°C extend for 30s, total 40 cycles. The primer sequence is displayed in [Table 1]. After the blood taken, partial aortas were cut into pieces. The samples were mix with buffer solution. The loading quantities of 50 μg total protein was added to 12% SDS-polyacrylamide gel electrophoresis and was electrophoresed at 60V for 30 min and 80V for 2 h in buffer systems (3.01 g tris, 18.8 g glycine and 1 g 0.5% SDS were dissolved by water to 1000 ml). After this, protein transferred to NC membranes at 80V for 2 h and half in transfer buffer systems (2.9 g tris, 5.8 g glycine and 0.37 g 0.5% SDS were dissolved by water to 800 ml, then pulsing 200 mL methanol). Then, the membranes were incubated at 4°C overnight with the primary antibody of GAPDH (1:1000; sc-59540, Santa Cruz Biotechnology, USA), MMP-9 (1:1000; sc-6840, Santa Cruz Biotechnology, USA), NF-κB p65 (1:1000; sc-8008, Santa Cruz Biotechnology, USA), and TNF-α (1:1000; ab157351, abcam, UK). After that, washing the membranes by 1xTBS with 0.2% Tween 20 and incubating the membranes with corresponding secondary antibody for 2 h. Exposing and scanning the blots, the quantitative results of blots were using the image analysis program (Image-Pro Plus 5.0). All the data were expressed as a mean ± standard deviation, and one-way ANOVA was applied to assess the statistical significance (SPSS 15, Inc., Chicago, IL, USA). The significance of differences between the control and treatment groups was determined at level P < 0.05 or P < 0.01. A total of 144 known compounds were obtained from TGW. As results, 34 candidate molecules were conformed to filter parameters of ADME properties (PerOB ≥30%, PerDL ≥0.18, and HL ≥4), and accounting for 23.6%. Although TPR had poor ADME properties of (PerOB = 17.84%), it was isolated from in TGW and exhibit the anti-AS effect. Thus, TPR was used for further study. Finally, there were 35 ingredients were chosen, shown in Table S1. ADME properties of PerOB for these active compounds were ranged from 30.16% to 107.71% and PerDL from 0.2 to 0.84. According to TCMSP database, we deleted the compounds which had no targets base on the TCMSP database or had not corresponding gene name based on Uniprot database, we obtained 17 potential compounds [Table 2] in TGW. 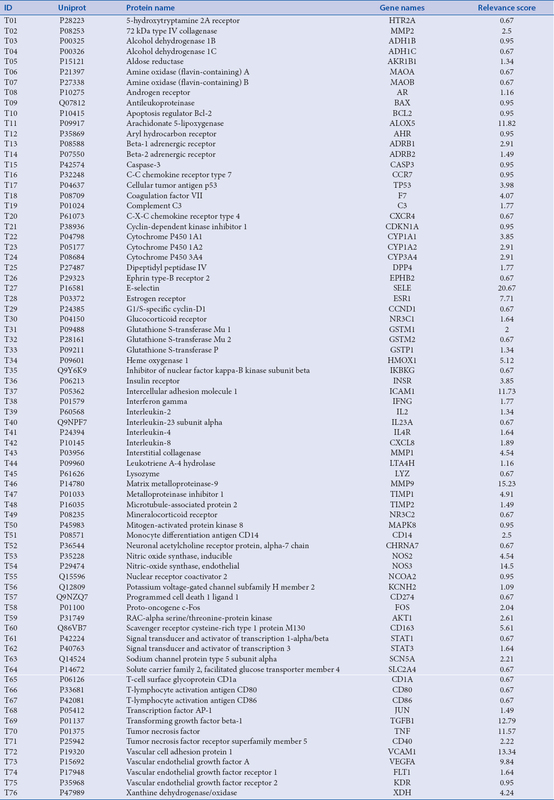 A total of 148 candidate targets for 17 compounds were obtained based on TCMSP database displayed in Table S2. Then, a visual graph of C-T network was set up based on potential ingredients and target, as shown in [Figure 1]. There were 165 nodes (148 candidate targets plus 17 compounds) and 325 edges, the average degree of per compound was 19.11. Kaempferol (MOL000422, degree = 57), beta-sitosterol (MOL000358, degree = 36), TPL (MOL003187, degree = 33), and TPR (MOL003186, degree = 25) possess higher degree number indicated more interaction with targets. We surmised that these ingredients in herb might be the key active compounds. It was known that pathogenesis of AS was very complex and the major processes were including lipid accumulation, inflammatory response, immunoreactions, and vascular structure change. As the research accumulating on AS, more and more related genes to it were obtained. To know which targets in the 148 candidate targets were correlated to the pathogenesis of AS, the candidate targets were further mapped to Genecards database and finally screened out 76 potential targets related to AS, as shown in [Table 3]. Searching KEGG and got pathways related to candidate protein targets. Target-Pathway network (T-P network) is displayed in [Figure 3], and 72 targets were mapped to 186 pathways, and an average degree of per target was 13.13, and an average pathway was 2.58. However, 4 of 76 targets had not been mapped into pathway. In the T-P network, we found that several targets could map into multiple pathways (83/176, n ≥ 5), might be the crucial factors for AS. Serial pathways, such as TNF signaling pathway (hsa04668, degree = 11) and NF-kappa B signaling pathway (hsa04064, degree = 8) were strongly correction to pathogenesis of AS of anti-inflammatory categories, meanwhile TNF signaling pathway was including remodeling extracellular matrix of MMP-9, which was close to vulnerable plaque stability in AS; Metabolic pathways (hsa01100, degree = 13) might be related to lipid accumulation. T-cell receptor signaling pathway (hsa04660, degree = 7) could influence the inflammatory factors of IL-2, TNF-α, and IFN-γ. In addition, some targets involved in the function of vascular structure, such as HIF-1 signaling pathway (hsahsa04066, degree = 12) was involved in regulating vascular tone and angiogenesis. The AS is a cardiovascular disease, characterized by the combination of chronic inflammation and lipid accumulation in vascular. Its pathomechanism is very complex and had no perfect drugs to cure. We had noticed that extract of TGW could improve AS and regulate blood lipids, but the certain mechanism was still unknown. We speculated that its efficacy might be related to multi-ingredient and multi-targets, and hence, the systems pharmacology method was used to clarify our ideal. As results, we found that 17 bioactive compounds with 76 therapeutic proteins might be the key points, Compounds of Kaempferol and Beta-sitosterol, for the sake of higher degree and TPL and TPR were main active ingredients and process of high degree, which indicated the four ingredients in TGW might be the most important for treatment AS. Through the analysis of KEGG Pathway, TGW influenced the pathways of TNF signaling pathway (hsa04668), NF-kappa B signaling pathway (hsa04064) and metabolic pathways (hsa01100), which were strongly correction to the pathogenesis of AS, might be primary mechanisms on the anti-AS. By analysis targets protein of active compounds, we found that TPL and TPR could influence on the pathogenesis of AS from points of anti-inflammatory, vulnerable plaque stability, and vascular structure, to further developing the TGW on anti-AS, we take TPL combined with TPR as whole to research the effect on the treatment of AS. From the H and E results, we found that large plaque was informed in model Apo E-/-mice, compared with NC group. TRL and TRR could decrease the developing of plaque. When observed the composite group, an interesting thing was happened that treatment with TRLR could significantly suppress the developing of plaque. The results are shown in [Figure 4]. Based on the TSCMP database, there were 266 kinds of herbs containing Kaempferol, such as Rubi Fructus, Chrysanthemi Flos et al. In addition, there were 499 kinds of herbs containing beta-sitosterol. Although Kaempferol and Beta-sitosterol were mapped to much targets, they were not the special compounds in TGW. TPL and TPR were the biomarker active ingredients in TGW. TPR is a quinone methide triterpenoid isolated from the TCM TGW. Recent studies showed that TPR (2 mg/kg/d, i. p.) inhibits atherogenesis in TPR -treated ApoE-/-mice fed an atherogenic diet by inhibiting inflammation in the arterial wall and other researches show that TPR (1 mg/kg/d, i. g.) effectively reduced the plaque ratio., TPL, a diterpenoid triepoxide purified from the TGW, was tested for its antitumor properties and anti-inflammatory. It had reported that TPL could suppress the release of TNF-α, which is strongly related to the pathogenesis of AS. Thus, TPL and TPR may be the main compositions in TGW to research their synergistic effect on suppressing the progress of AS. The present study revealed that TPL (TRL, 0.2 mg/kg/d) and TPR (TRR, 0.6 mg/kg/d) could decrease the developing of plaque in aortas of Apo E-/-mice, which is consistent with previous reports.,, An interesting thing was happened that treatment with TRLR (TRL, 0.2 mg/kg/d plus TRR, 0.6 mg/kg/d) could more significantly suppress the developing of plaque, which suggested that TRL and TRR may have a synergistic effect on anti-AS. Reverse transcriptase-PCR (RT-PCR) analyses were performed to determine the effect of TRL, TRR, and TRLR on MMP-9, TNF-α, and NF-κB in Apo E-/-mice. The results are shown in [Figure 5]. 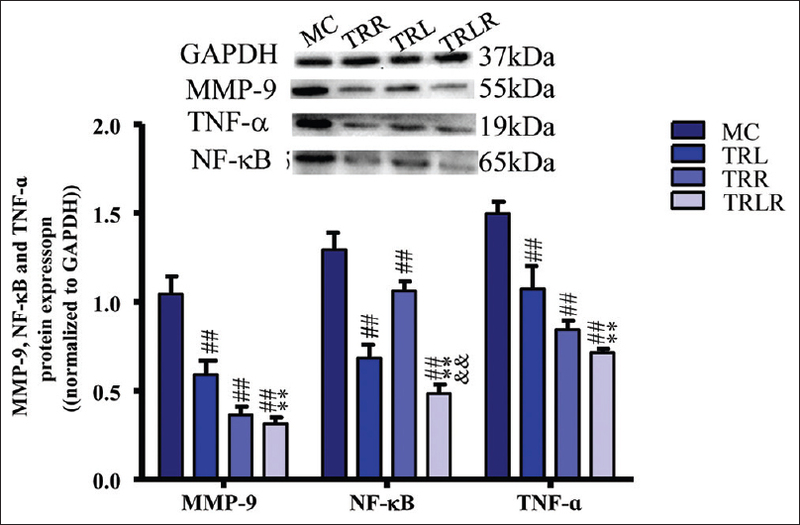 The mRNA expression of MMP-9, TNF-α and NF-κB were significantly decrease in TRL group and TRR group (P < 0.01). Moreover, the similar trend was appeared in TRLR treated group after administrated for 8 weeks (P < 0.01) with more notable decrease. What is more, TRLR effect on down-regulating of mRNA MMP-9 and NF-κB expression were more significant than TRL or TRR alone (P < 0.01, 0.05). As we had noticed that TRL and TRR could influence the inflammatory reaction and vulnerable plaque stability indicator such as MMP-9. Western blot was used to observe the protein expression of TNF-α, NF-κB, and MMP-9 in aortas after drugs intervened. The inflammatory factors, such as TNF-α and NF-κB were important factors in forming plaques. 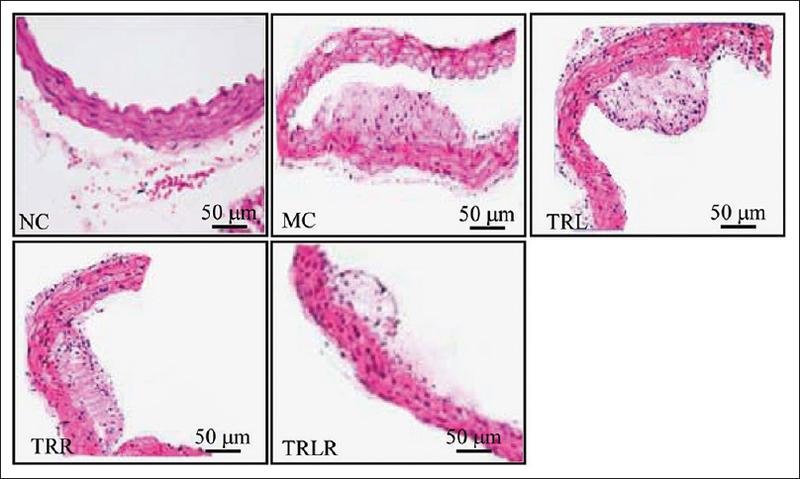 MMP-9, playing a significant role in the occurrence, development, and rupture of the AS plaque with inflammatory factors were applicable for investigating the anti-atherosclerotic effect. Compared to MC group, TRL, TRR, and TRLR could significantly decrease the expression of TNF-α, NF-κB, and MMP-9 (P < 0.01), and TRLR could reduce these indicators by a bigger margin, which indicated that TRLR had a synergistic effect on improving AS [Figure 6]. It was well known that ox-LDL could entice NF-κB activation, NF-κB activated would participate in the expression of many inflammatory mediators, such as TNF-α. On the other hand, NF-κB activated by ox-LDL could regulate up expression of adherence factors, such as VCAM-1 and ICAM-1. 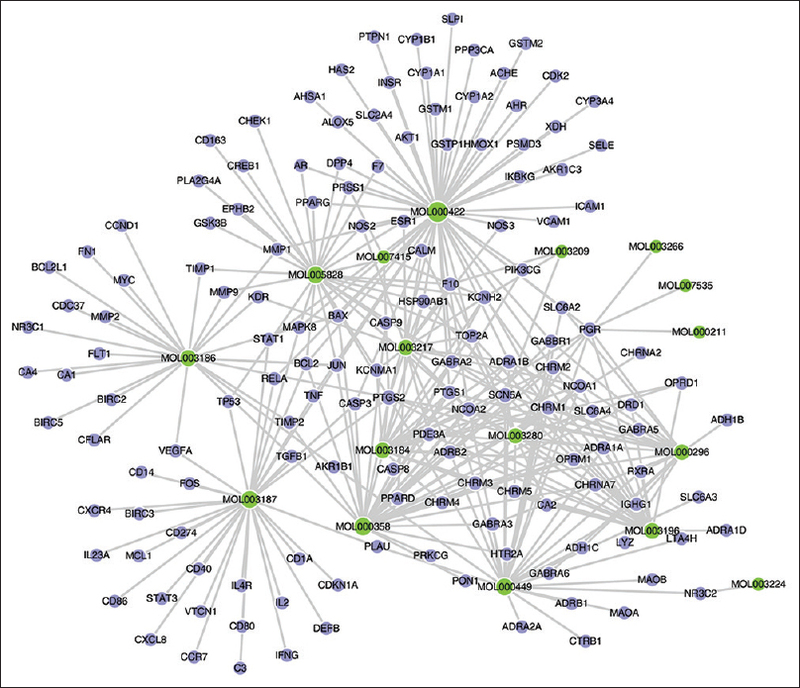 In the present study, the C-T network and T-P network analysis had also found that TRL and TRR could target TNF-α directly or participate in the NF-kappa B signaling pathway through TNF-α, CD14, or CD40. Our pharmacodynamic experiment further verified that TRL, TRR, and TRLR could all significantly alleviate NF-κB and TNF-α in aortas of Apo E-/-mice by RT-PCR and western blot, and the effect of TRLR was more notable. MMP-9, which is an important biological marker of inflammatory factors, plays a significant role in the occurrence, development, and rupture of the AS plaque., On the other hand, it had reported that macrophage and smooth muscle cell isolated from AS plaque cultured in vitro could secrete lots of MMP-9, which also could be pointing the damage of vascular in AS. Systems Pharmacology analysis had pointed that TRL and TRR could effect on MMP-9. In our pharmacodynamic experiment study, supplementation with TPL and TPR alone or combination of TPL and TPR to Apo E-/-for 8 weeks could decrease the expression of MMP-9 in aortas, with reducing atherosclerotic plaque size. To sum up, TGW could regulate AS by multiple pathways, especially immune response, inflammatory response, vascular structure improving, had synergistic effect by interactive effect of different compounds. What's more, the major compounds of TPR and TPL in TGW had synergistic effect on anti-AS by suppressing MMP-9, TNF-α, and NF-κB. The reported work was supported by China National Natural Science Foundation (No. 81570392), the National Key Research and Development Program of China (No. 2016YFE0126000), China Postdoctoral Science Foundation funded project (No. 2016M591937), and Natural science fund for colleges and universities in Jiang su Province (No. 16KJB320017). Esper RJ. Atherosclerosis, an immuno-inflammatory disease. Prensa Méd Argent 2009;96:552-70. Tietge UJ. Hyperlipidemia and cardiovascular disease: Inflammation, dyslipidemia, and atherosclerosis. Curr Opin Lipidol 2014;25:94-5. Herrington W, Lacey B, Sherliker P, Armitage J, Lewington S. Epidemiology of atherosclerosis and the potential to reduce the global burden of atherothrombotic disease. Circ Res 2016;118:535-46. Dawber TR, Moore FE, Mann GV. II. Coronary heart disease in the Framingham study. Int J Epidemiol 2015;44:1767-80. Kim J, Song TJ, Song D, Lee HS, Nam CM, Nam HS, et al. Nonrelevant cerebral atherosclerosis is a strong prognostic factor in acute cerebral infarction. Stroke 2013;44:2013-5. Lockhart PB, Bolger AF, Papapanou PN, Osinbowale O, Trevisan M, Levison ME, et al. Periodontal disease and atherosclerotic vascular disease: Does the evidence support an independent association? : A scientific statement from the American Heart Association. Circulation 2012;125:2520-44. Libby P. Inflammation in atherosclerosis. J Assoc Physicians India 2012;48:265-6. Mullenix PS, Andersen CA, Starnes BW. Atherosclerosis as inflammation. Ann Vasc Surg 2005;19:130-8. Mackness B, Hine D, Liu Y, Mastorikou M, Mackness M. Paraoxonase-1 inhibits oxidised LDL-induced MCP-1 production by endothelial cells. Biochem Biophys Res Commun 2004;318:680-3. Mallavia B, Recio C, Oguiza A, Ortiz-Muñoz G, Lazaro I, Lopez-Parra V, et al. Peptide inhibitor of NF-κB translocation ameliorates experimental atherosclerosis. Am J Pathol 2013;182:1910-21. Jia G, Cheng G, Gangahar DM, Agrawal DK. Insulin-like growth factor-1 and TNF-alpha regulate autophagy through c-jun N-terminal kinase and akt pathways in human atherosclerotic vascular smooth cells. Immunol Cell Biol 2006;84:448-54. Gough PJ, Gomez IG, Wille PT, Raines EW. Macrophage expression of active MMP-9 induces acute plaque disruption in apoE-deficient mice. J Clin Invest 2006;116:59-69. Liu J, Jiang Z, Xiao J, Zhang Y, Lin S, Duan W, et al. Effects of triptolide from Tripterygium wilfordii on ERalpha and p53 expression in two human breast cancer cell lines. Phytomedicine 2009;16:1006-13. Tao X, Lipsky PE. The chinese anti-inflammatory and immunosuppressive herbal remedy Tripterygium wilfordii hook F. Rheum Dis Clin North Am 2000;26:29-50, viii. Tao X, Davis LS, Lipsky PE. Effect of an extract of the chinese herbal remedy Tripterygium wilfordii hook F on human immune responsiveness. Arthritis Rheum 1991;34:1274-81. Tao X, Younger J, Fan FZ, Wang B, Lipsky PE. Benefit of an extract of Tripterygium wilfordii hook F in patients with rheumatoid arthritis: A double-blind, placebo-controlled study. Arthritis Rheum 2002;46:1735-43. Bao J, Dai SM. A chinese herb Tripterygium wilfordii hook F in the treatment of rheumatoid arthritis: Mechanism, efficacy, and safety. Rheumatol Int 2011;31:1123-9. 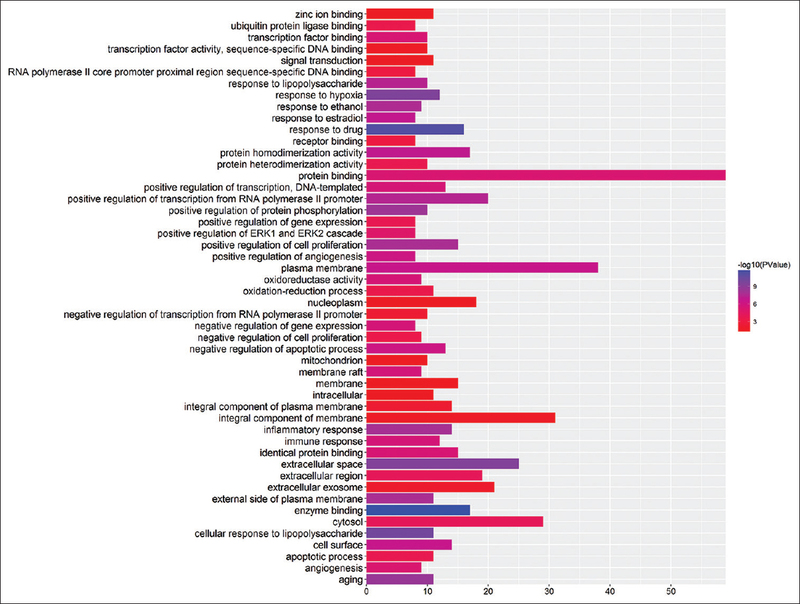 Berger SI, Iyengar R. Network analyses in systems pharmacology. Bioinformatics 2009;25:2466-72. 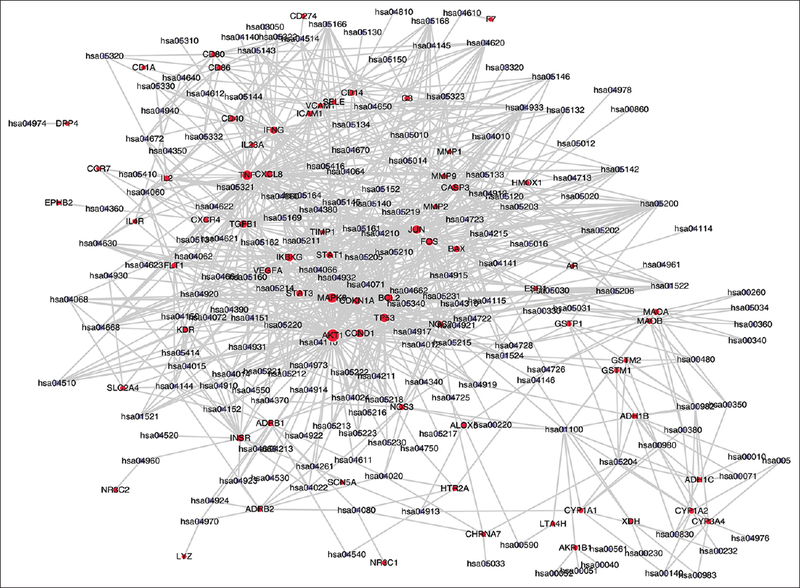 Zhao S, Iyengar R. Systems pharmacology: Network analysis to identify multiscale mechanisms of drug action. Annu Rev Pharmacol Toxicol 2012;52:505-21. Ru J, Li P, Wang J, Zhou W, Li B, Huang C, et al. TCMSP: A database of systems pharmacology for drug discovery from herbal medicines. J Cheminform 2014;6:13. Rebhan M, Chalifa-Caspi V, Prilusky J, Lancet D. GeneCards: Integrating information about genes, proteins and diseases. Trends Genet 1997;13:163. Bairoch A, Apweiler R, Wu CH, Barker WC, Boeckmann B, Ferro S, et al. The universal protein resource (UniProt). Nucleic Acids Res 2005;33:D154-9. Kanehisa M, Goto S, Kawashima S, Okuno Y, Hattori M. The KEGG resource for deciphering the genome. Nucleic Acids Res 2004;32:D277-80. Dennis G Jr., Sherman BT, Hosack DA, Yang J, Gao W, Lane HC, et al. DAVID: Database for annotation, visualization, and integrated discovery. Genome Biol 2003;4:P3. Lu C, Yu X, Zuo K, Zhang X, Cao C, Xu J, et al. Tripterine treatment improves endothelial progenitor cell function via integrin-linked kinase. Cell Physiol Biochem 2015;37:1089-103. Lutgens E, Daemen MJ. CD40-CD40L interactions in atherosclerosis. Trends Cardiovasc Med 2002;12:27-32. Fiotti N, Altamura N, Fisicaro M, Carraro N, Uxa L, Grassi G, et al. MMP-9 microsatellite polymorphism and susceptibility to carotid arteries atherosclerosis. Arterioscler Thromb Vasc Biol 2006;26:1330-6. Wang X, Ria M, Kelmenson PM, Eriksson P, Higgins DC, Samnegård A, et al. Positional identification of TNFSF4, encoding O×40 ligand, as a gene that influences atherosclerosis susceptibility. Nat Genet 2005;37:365-72. Zhu F, Li C, Jin XP, Weng SX, Fan LL, Zheng Z, et al. Celastrol may have an anti-atherosclerosis effect in a rabbit experimental carotid atherosclerosis model. Int J Clin Exp Med 2014;7:1684-91. Han Z, Tang Z, Li P, Yang G, Zheng Q, Yang J. Celastrol attenuates atherosclerosis in Apolipoprotein E (apoE) knockout mice fed an atherogenic diet. Afr J Pharm Pharmacol 2011;5:1247-51. Luo L, Yang T. Triptolide inhibits the progression of atherosclerosis in apolipoprotein E-/- mice. Exp Ther Med 2016;12:2307-13. Mei LI, Zong WU, Qin Y, Zhong R, Zhang L, Li LI, et al. Effects of triptolide on the release of TNF and IL-6 in vivo and in vitro. Acad J Second Military Med Univ 2000;21:254-6. Cominacini L, Pasini AF, Garbin U, Davoli A, Tosetti ML, Campagnola M, et al. Oxidized low density lipoprotein (ox-LDL) binding to ox-LDL receptor-1 in endothelial cells induces the activation of NF-kappaB through an increased production of intracellular reactive oxygen species. J Biol Chem 2000;275:12633-8. Gerszten RE, Lim YC, Ding HT, Snapp K, Kansas G, Dichek DA, et al. Adhesion of monocytes to vascular cell adhesion molecule-1-transduced human endothelial cells: Implications for atherogenesis. Circ Res 1998;82:871-8. Tang X, Yang H, Nie Y, Jiang B, Huo R. Observation of NF-κB and ICAM-1 in stroke-prone renovascular hypertensive rats. China J Mod Med 2009;3:1-6. Sluijter JP, Pulskens WP, Schoneveld AH, Velema E, Strijder CF, Moll F, et al. Matrix metalloproteinase 2 is associated with stable and matrix metalloproteinases 8 and 9 with vulnerable carotid atherosclerotic lesions: A study in human endarterectomy specimen pointing to a role for different extracellular matrix metalloproteinase inducer glycosylation forms. Stroke 2006;37:235-9. Scoditti E, Calabriso N, Massaro M, Pellegrino M, Storelli C, Martines G, et al. Mediterranean diet polyphenols reduce inflammatory angiogenesis through MMP-9 and COX-2 inhibition in human vascular endothelial cells: A potentially protective mechanism in atherosclerotic vascular disease and cancer. Arch Biochem Biophys 2012;527:81-9.